Yum! What else can you say? 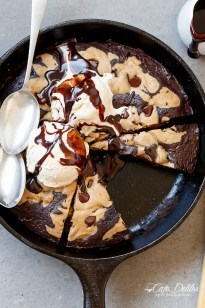 Swirls of chocolate brownie around scrumptious chocolate chip cookie dough. Yum! Heat the oven to 175°C | 350°F. Lightly grease an 9-inch cast iron skillet or round baking pan with oil; line the base with parchment (or baking) paper; set aside. In a medium-sized bowl, whisk the butter and sugars together well until the sugar has dissolved. Add the cocoa powder, whisking until dissolved and smooth. Beat in the egg and vanilla until well incorporated (about a minute). Fold the flour and salt through until the better is smooth and thick. Pour in the water and lightly mix it through until the batter is smooth (it will still be quite thick). Set aside. In a separate medium-sized bowl, beat the butter and sugars together until light and fluffy. Add the egg and vanilla, beating until smooth. Add in the flour, baking soda and salt, folding the dry ingredients through until a cookie dough forms. Fold in half of the chocolate chips; set aside. Pour the brownie batter into the skillet (or pan) and spread out evenly with a spatula (or the back of a metal spoon). Scoop the cookie dough into the brownie batter; sprinkle with the remaining chocolate chips; and bake for 30-35 minutes, or until the cookie is golden and the edges are set and pulling away from the sides of the pan. Do not over bake or it will be dry instead of moist and fudge-like. Allow to cool in the pan for about 10 minutes and serve hot.